The Bible was wrong. For evidence look to, well, the Bible. 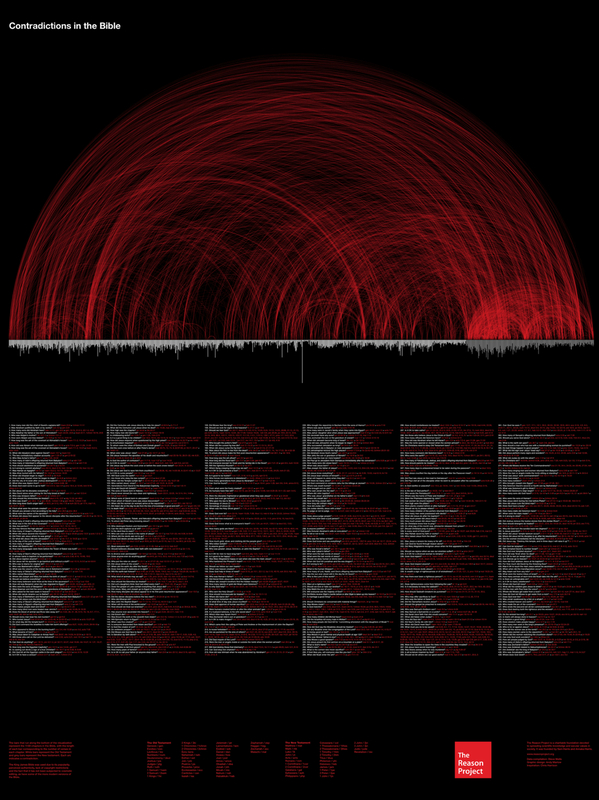 Such is the conclusion of this stunning, provocative infographic, which maps contradictions in the Bible, from whether thou shalt not commit adultery down to the color of Jesus’s robes. Career skeptic Sam Harris commissioned the chart for his nonprofit foundation Project Reason, with graphic design by Madrid-based Andy Marlow. 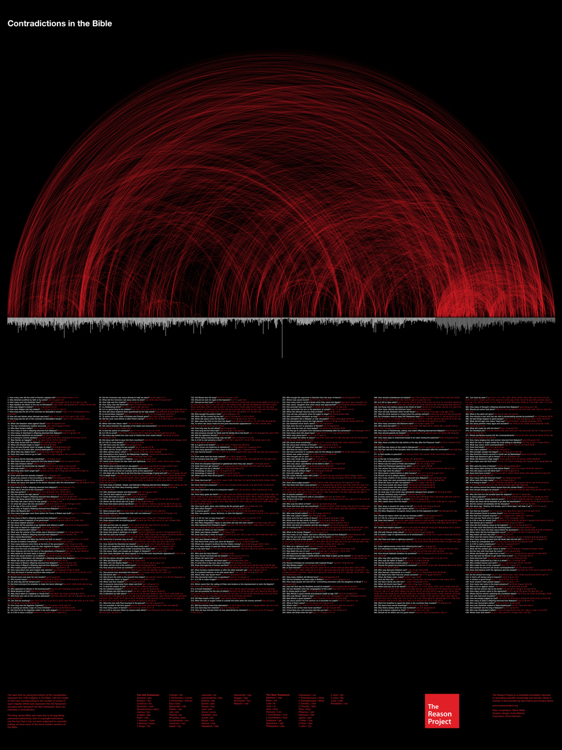 Whatever your religious views, it’s an incredible testament to the power of data visualization. It’s managed to make an ancient text — over which men have fought wars and women have sacrificed babies — look downright silly. The organization here is pretty simple. 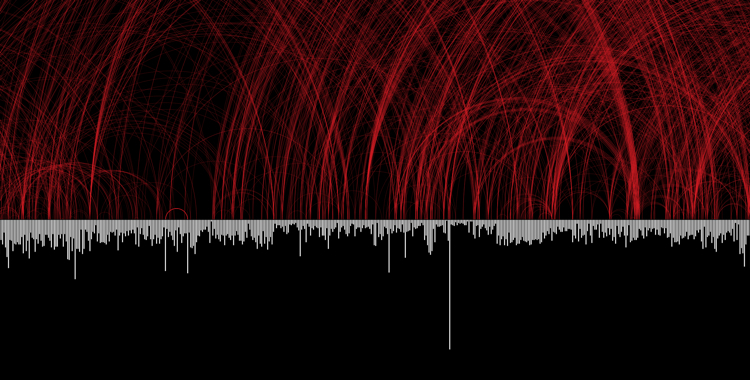 You’ve got bars at the bottom representing the 1,189 chapters of the King James Bible. White’s for the Old Testament, gray’s for the New Testament. Then a red arc links all the parts that contradict each other. Steve Wells, the guy who compiled the data, cites 439 — 439! — questions the Bible equivocates on, often in several places. Even something as seemingly incontrovertible as how old Abram was when Ishmael was born has more than one answer (see Genesis 11:26; Genesis 11:32; Genesis 16:16; and Acts 7:2-4). For the full key, download the chart as a PDF. So to anyone who thinks the Bible’s the last word on anything, remember this: It isn’t even the last word on itself.